Note: You can download the slides from this presentation here. This is a transcript of the talk given by Simi Ojuri from TwentyThree at the HubSpot User Group Meeting in June 2018. Hello everyone!How are you guys doing today? Good, I hope. Firstly, I just want to thank Clwyd so much for having us here. We're really excited to be here. I can just start by introducing myself a little bit. My name is Simi Ojuri. I'm from California, hence the non-British accent, but I've been working across digital media, e-commerce and a bit in product development at companies like Discovery Communications. Then I moved to Copenhagen sometime last year to actually pursue my Master's studies and there I found TwentyThree and I've been working with them on the partnerships team with our video marketing platform. Basically on the partnerships team we're helping agencies across the world become video marketing experts and help to implement those video strategies for their clients. Today I'll be talking to you a little bit about video marketing and specifically how to run your video properly across your entire marketing funnel. I think this definitely just sets a scene about how powerful video can be for marketers and how useful it can be, but what's important is to make sure that we're measuring video properly so we can really harness the power that it has. This is kind of a state of video marketing today. We have the qualitative side of video and we have the quantitative side of video. We know that video is great for communicating and for storytelling. It's superhuman and very relational, but today the quantitative side of video is really lacking. What we want is for these two circles to be more equal in size and we want to put as much stock into creating and producing our video as we are into measuring it, because at the end of the day, if we have all this really great content that's super engaging but no one's watching it, then it's really worth nothing to us and to our brand. 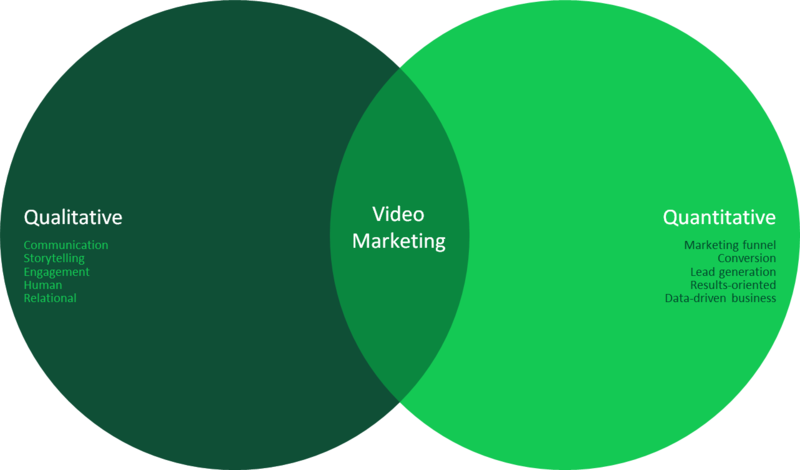 Before I talk about some of the best practices for video marketing, I'll just go a little bit into about what's wrong with video today. For that we kind of have 8 lessons. 1. The first is that the majority of marketers are only using video at the top of their buyer's journey. The problem with that is we want marketers to be thinking with more of a full funnel mindset, so thinking about how they can map out the funnel using video. Maybe that's using a case study video, maybe it's using a webinar. But what are the different types of videos that we can use across the funnel to move our users down? 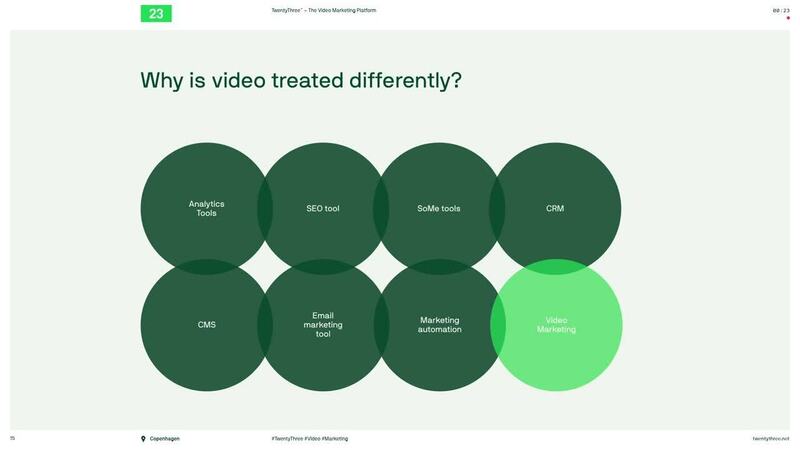 2.The second thing is our marketers properly measuring video through their funnel and overwhelmingly the answer is no. We found actually here that only 55% of marketers are measuring the amount of plays, which is really insane because that number should be 100%, because measuring plays is essentially like measuring clicks to your website. Why wouldn't you be doing that? But going beyond that, we want marketers let go of these metrics and use metrics that are more important for their video. That's engagement and measuring conversions and leads generated, because that tells you a lot more about how your audience is engaging with your video. 3. The third thing is you're most likely producing the wrong videos and I like to rephrase this to say if you're not measuring your videos, you don't really know what works and what doesn't. We tracked over a billion video plays and we saw that videos under 2 minutes accounted for 51% of videos being produced but only accounted for 11% of the engagement, while videos that were more than 45 minutes long were 3% of the videos being produced, but accounted for almost 30% of engagement. You can see there is a discrepancy there between the types of videos being produced and the types of videos that are actually driving engagement. Something I'd like to point out is that this data might not be true for every brand. For example, if you're a B2C company maybe a 2 minute video is going to work best for you, while if you're a B2B company, a 45 minute video might work best for you. What's important is that if you're not testing your video, you really don't know what's working and what's not. These numbers are changing even more drastically in 2018. 4. and 5. The fourth and fifth things are that marketers are stuck on a platform or two: they're throwing a video on Facebook, they throw a video on YouTube, but they're not remembering to run video across every single platform. You want to figure out how you can run video everywhere and, more specifically, how you can run video on your website, because your website is the place that ultimately you want all of your users to be going and that's where you can track them the best. 6. The sixth thing is that, by not using trackable video on your website, users are leaving your website and going to YouTube. This example is from Nike website. You're on the Internet and you're browsing and you're looking for a pair of running sneakers, or maybe you want some snazzy yoga pants or whatever it is that you want. You end up on their site and you want to watch a product video immediately. They push you to their YouTube channel, so all of the money that gets invested (maybe say it's Google Ad Dollars to get you there), you've just now been pushed out of their marketing funnel. To avoid this, you want to use things like video landing pages or video hubs and host them all on your website. That way you're keeping users inside of your funnel, but I'll talk a little bit about that later. 7. The same can be said of email. Maybe your email marketing team creates this email with really snazzy copy, but they click on the link and you get sent to YouTube. Maybe you're getting suggestions for videos that are unrelated, like cats on a piano or just things that are very unrelated to the type of content that you're providing. You don't want to be doing this. You want to be sending users not to a third party platform, but to your website in order to keep them inside of your funnel. 8. The last thing is that your lead scoring and attribution data can be off by up to 50%, if you're not tracking your video. If you're just simply embedding a Facebook video or YouTube video onto your website, then your lead scoring and attribution is definitely off. If we think about all of the information that we're tracking, we track everything: who's clicking on a Twitter page, how many people are ending up on a form or on a landing page. But so much of our data is coming from video and we're not really tracking that properly. If you're not tracking your video properly, then your lead scoring and attribution can't be accurate either. Basically what we're saying is that video marketing is being treated differently at the moment. It's being treated kind of as an afterthought. We're creating all this fantastic content, but we're not really tracking it and measuring it properly. All we're going to do is bring video marketing fully into the tech stack and make sure it is given the right attention that it needs. This slide just kind of sums up the 8 points that I talked about and now I'll go a bit into video marketing best practices and some things that marketers are doing in 2018 to leverage their video. The first thing that you should be doing is measuring beyond the top of the funnel and a great way to do that is to run shorter versions of your video to attract your users and then drive them to your website. This example is from a B2B company. They had an event that they were running and so they had a marketing thought leader create a smaller version of a video they put on Facebook. Then, in order for users to actually find out more information and to register for the event, they had to go to the website. So just kind of linking them to the website so they can do that. These people really understood the power of video, but also the power of getting users to really where you want them to go and moving them down that funnel. We found that, on average, the user watches 58 seconds of video on YouTube, 20 seconds of video on Facebook, but almost 4 minutes of video on your website. It just shows how important it is to make sure that you're actually hosting a video on your website and giving people the opportunity to make it to your website and not just stay on those social platforms. This is also just showing that those numbers are changing even more in 2018. 79% of marketers are using video for brand awareness, however, only 38% of them are measuring video engagement on their website. Again, just showing the discrepancy between the amount of people that are actually using video and the amount of people that are measuring video. The second thing you can do is to start measuring engagement and conversions, instead of videos and plays. This example is from a Danish company. Basically, they put a video hub on their website and, from that, they found that they had 3x higher conversion rate and 45% more engagement. So instead of sending people to their YouTube channel, they were actually able to have everything on their website and ultimately provide their audience with more relevant content. The third thing is to produce and measure the right length of content for your audience. This example is from a company in San Francisco. They pair doctors with patients. They had a conference where they sold out tickets, so they had a long waiting list of people. Their question was: we have all these people that are clearly interested, what can we do to get them involved? So they decided to host all of their speaker sessions live and they also provided all the video content on demand. From all of this content, they were able to generate over a thousand leads and they found out that people, on average, were watching 27.4 minutes of their video. If someone's going to your website and watching 27 minutes of video, then you're obviously doing something right and you should continue to produce that type of content. I also just threw this stat pack up here, which is what I mentioned earlier about the discrepancy between the types of videos being produced and the types of videos driving engagement. Now they've realised that they can produce longer form content because it works for their audience, but they wouldn't have been able to do that if they hadn't been measuring their video to see what really works and what doesn't. The fourth thing is to run video across every channel, your website and your emails. This example is from Fitness DK. They are a gym in Denmark and they have lots of local branches. They run over 40 different Facebook pages for all them. They also put a video hub upon their website to host all of their videos and so, by doing this, they were able to increase engagement on their website by 185.5%. Because they were using a video marketing platform, they were really easily able to manage all of their video campaigns on all their different Facebook pages. It's just a really good example of how you can be running your video everywhere. You can use video to increase leads. Universal Robots is a company that creates robotic arms and other very cool robotic things so, as you can imagine, they have really engaging content, but they just didn't really know what to do with it. They decided to gate their content using video collectors. It's basically just something that goes over your video asking people that haven't yet been identified for other information, so that they can continue watching the content. By implementing these video collectors, they were able to see that 50% of all the contacts they generated were from video collectors. By just doing that, they were able to see that lead generation through video is a strategy that works for them. But only 18% of marketers today are using videos to collect leads. So you can do it! There's a big opportunity to test out whether lead generation through video is something that might work for your brand or business. You can also use GIFs and animated thumbnails to improve click-through rates on your website. For this example, this company was using email. Instead of just having a static image, they used a GIF and they increased their click-through rates by 62%. It's really an easy fix, but it generates good results. 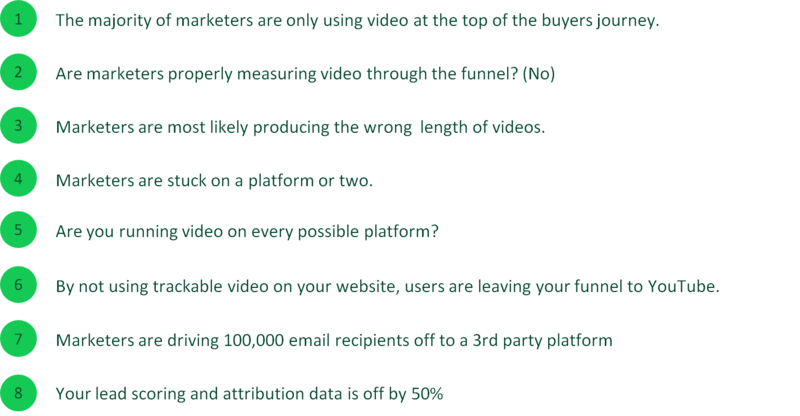 The last thing is that you shouldn't be putting your video metrics into a silo. This example is from Branch. They integrated video using TwentyThree with their marketing automation account and, since they did this integration, they've been able to identify over 4,000 leads in their video marketing automation tool. They found that people watch, on average, 10 minutes of video on their website and they've been sending all these data to their marketing automation platform. Say someone is watching a video for a certain amount of time. They can set up an automated workflow through their email saying "Hey, I see that you're interested in this product. Do you want to find out more information?" and because their video metrics weren't just living on YouTube or Facebook, they were able to leverage these data across the entire organisation. They went a step further sending their information to Salesforce, where their sales team could do targeted outreach and say "Okay, I've seen that you've watched 15 minutes of video across our website or 15 minutes of video on this specific topic. Do you have any questions for this specifically?" Taking your video metrics out of a silo is a great way to make sure that you can use data across your entire organisation. Just to bring it back to where we started: we want the qualitative and the quantitative side of our video to be equal to each other. We want to put as much stock into creating and producing our video as we are into measuring our video. I'll just briefly go into what we at TwentyThree are doing to modernise video. First, we have analytics. We want your video analytics to be on par with your web analytics. We're aggregating data from YouTube, Facebook and all of the channels you're using on your website, so you can see which channels are performing best. All from one platform. 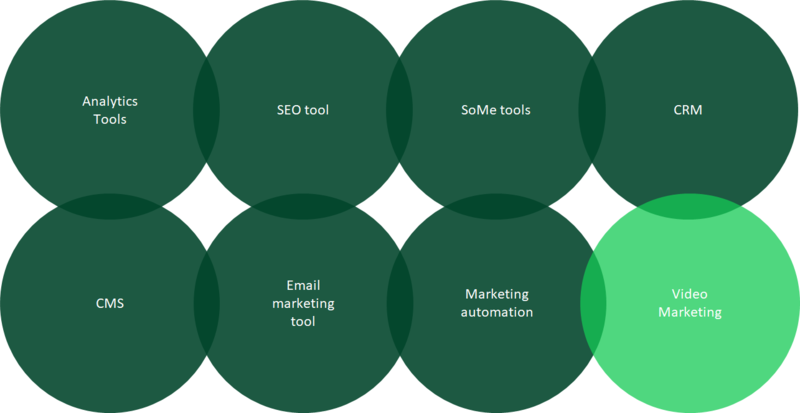 We are integrating with marketing automation tools like HubSpot. Like I said before you don't want your video metrics in a silo, so we're sending all this information to HubSpot. We have a two-way sync that provides deep integration. You can see things like real time video heatmaps inside of HubSpot. You can see email video previews, different things, all from one spot. We're allowing you to run video everywhere. We offer native distribution to Facebook, Twitter, YouTube and we're actually the first video marketing platform to offer the native distribution to LinkedIn. So we're proud of that. We allow you to integrate video into your email campaign, so you can use trackable GIFs and thumbnails in your video you can directly integrate with your email platforms. These are all the things that we're doing and it kind of addresses all of the pain points that you might have with your video. Just to leave you off with some things, I have a challenge for you...which is actually 4 challenges! 1. The first thing is to produce the right full-funnel content. Figure out what's right for your brand. If you've never tried to do a webinar, test out doing the webinar. If you've never tried to do a 32 seconds Facebook video, test it out. See what's really working in terms of content. 2. Also test which channels are working for your video content. Is Facebook really the best channel for your content or is your website the best channel for your content? I would argue that your website would be the best channel for your content, but don't just take my word for it...try it out and see what's working. 3. 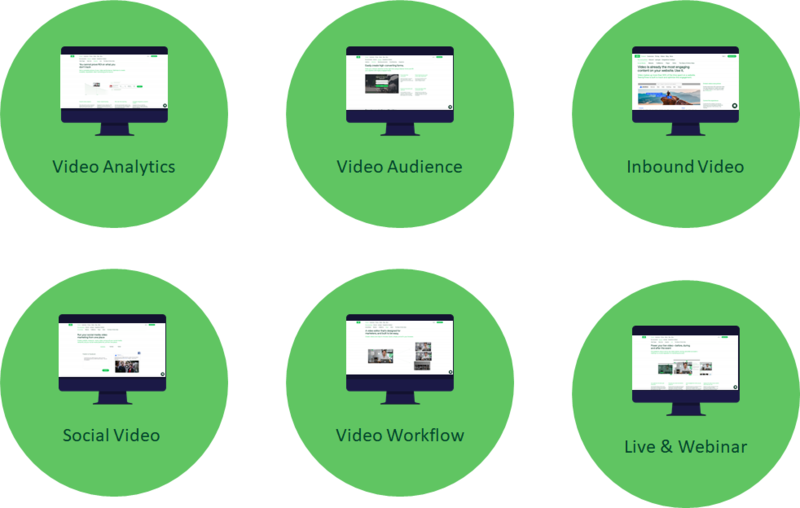 The third thing is make sure that you're integrating video across all of your existing tools. There are many great tools out there, so make sure you're sending all of your video metrics and all of your data to these tools like HubSpot, Google Analytics, things that will help you with your lead scoring and your attribution. 4. Lastly, you should be using a video marketing platform and it can be literally any video marketing platform. I think that TwentyThree offers the best product, but it doesn't have to be ours. Just make sure that you're taking steps further than just posting a video on Facebook and on YouTube and then totally forgetting about it.